It is horrible when your plans have are interrupted by tooth pain. It keeps you up at night, and even ruins your appetite while tempting treats cause sensitivity issues. So what’s causing your tooth pain? Luckily, our Manteca dentist is on hand to help diagnose the problem. As the dentist Manteca residents look to for their restorative and cosmetic dentistry needs, we can find you the solution for your oral health issues and get you back to your fun-filled activities. It’s possible the pain is due to a cavity, which requires a simple filling. However, at times, the problem could be larger, necessitating the need for a dental implant. 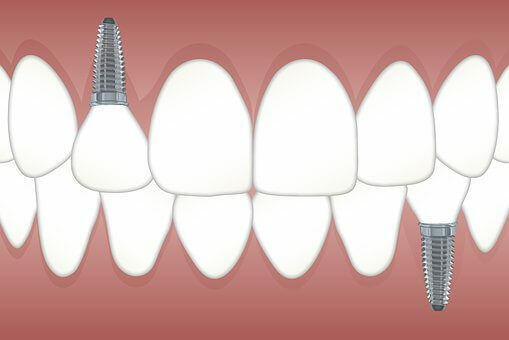 A dental implant is essentially an artificial tooth. It is used when an adult tooth has died or been severely compromised due to an injury or accident. The good news is that our Manteca dentist is highly skilled and experienced in providing dental implants. There are various ways to make you comfortable so that the procedure is nearly pain-free. The old tooth is removed to prevent infection and the implant is implanted so you don’t suffer bite problems and TMJ issues down the road. Are there any side effects to dental implants? There are no side effects with dental implants. In fact, without a dental implant, you would have many side effects. When a tooth is missing temporomandibular joint dysfunction can occur. Additionally, if a tooth is absent, your other surrounding teeth will move into the empty space as they are no longer being supported by their neighboring tooth. This causes your tooth alignment to malfunction and can create a need for braces. Even cleaning implants that our Manteca dentist put in place is no different than regular brushing and flossing; and of course, regular dental exams help, too. Dental implants consist of a post which is surgically implanted into your bone. In time, the post will fuse to your bone creating a strong base, or root, for your replacement tooth. The post is fitted with a crown. The crown is designed to look exactly like your natural tooth. This is put over the post and blends in with your own existing teeth and smile. If tooth pain has you distraught this year, don’t hesitate to give our Manteca dentist office a call. Whether it is a minor or major issue, we’ll walk you through our available services in order to keep your smile looking great. The longer you wait, the more damage and decay your tooth will experience. Our preventative and restorative dental services will allow you to barely miss a moment. For more information regarding our services, visit our Facebook page or give us a call.